Here is more information about my big project of late. We're moving our users to an environment of stateless connections so they can resume between multiple end point devices. The GNOME desktop and backend software has changed minimally, and focus on this change was making speed optimizations and getting the desktop and software to work on as many devices as possible. The simplified diagram below shows how end points connect. 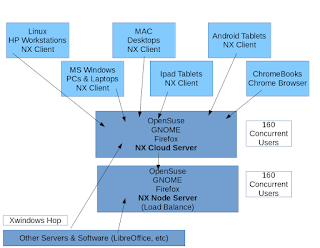 A NX Cloud server is the exposed server, and watches for connections over the NX protocol and for logins with a web browser. A second Node server sits behind the Cloud server and will provide load balancing of users. In the old "remote X" configuration, Firefox was running on its own server and had an Xwindows hop back to the workstation. This worked great for many years, but with recent changes in video content and HTML construction, it's gotten too slow. Now, Firefox is housed on the same server providing the NX transport and this has provided a huge speed gain. Pages load and scroll immediately and typing is perfectly crisp and fast. Other software applications that are not as impacted by running over remote X, are still housed on remote servers. If you click on LibreOffice for instance, it's handed off to another server -- it then hops over Xwindows back to the GNOME/NX server and out to the endpoint device via the NX compression. Speaking of endpoints, we now are able to provide logins to 6 platforms. After entering your credentials, the GNOME desktop appears identically on all devices. And if you are logged into one endpoint, and then log into a second endpoint the session immediately hops to the later device without loss of keystroke. With the compression of NX "lighweight" mode, everyone runs quickly over all types of networks and speeds. Top goals: Identical software, fast response and resuming. The most recent end point offering is using a ChromeBook. This is not yet in production, and being tested mostly by me at this point. We purchased a HP 14 inch ChromeBook with 4GB memory for around $250. It boots immediately. After opening the Chrome browser, you just put in the right URL and credentials and after a few seconds the GNOME desktop appears. The experience is then the same as the other platforms and this platform will resume sessions started on other types of devices. This ChromeBook is full 1920x1080 and provides an excellent canvas space for running software. In the shots below, I am logged into GNOME with just a Chrome web browser. All software runs natively and doesn't even know it's running inside a browser. Response is crisp and fast and this integrates nicely with our city workstations. Current projects: Continued testing of Chromebooks, end user training on using NX technology, continued migration of users to NX and starting to look at replacing this older GNOME 2 desktop with GNOME 3. It will be interesting to see how it runs with NX technology. Many more blogs to follow in this regard. I've been following your blog for years. Initially I was absolutely fascinated by your implementation 10 years ago (or however long ago it was) and thought it was one of the coolest things I had seen. But today, does any of this really make sense? You're going to such great trouble reinventing the wheel on such a small scale. If you or any of the other key stakeholders leave, this complex linux based environment is just going to fall apart. You do a lot of custom GUI applications which could really be replaced with web apps. Granted there would be a transition cost since you have tons of applications, but over time it could be done. 10 years ago we loaded dozens and dozens of custom apps on workstations. Everything was so complicated. But today you basically need a browser and MS office which includes email. I'm hardly a Microsoft fanboy but it seems like you could have a few trained monkeys deploying images built by one person and a relatively standard AD setup, and just a bunch of web apps, for a fraction of the salary cost of what it takes you guys to keep developing all this custom stuff nobody else in the world uses in city government (or anywhere else for that matter). I would think all it would take is a new mayor or city council at some point to just completely obliterate all the stuff you're doing and replace it with something modern. Hey, Dave; good to see you're back. Do you know that I was surprised to see you were transitioning to NX from X; for some reason I had it in my head your old architecture was based on Xvnc or something similar. Pretty we chatted some about it, back in the mists of time. I'm now working for Ian Blenke -- who's had some similar chats with you -- on deaf/HOH relay stuff; we're under contract to the FCC to build a multiplatform videophone client tuned specifically for such interpreted calls. FCC was kind enough to specify we should do everything as open source, and we're upstreaming changes on a bunch of stuff. In a related story, somewhere back down the scroll, someone asked you about Rasberry Pi based clients. http://www.amazon.com/gp/product/B013ILLPN8 -- in case a straight RPi isn't fast enough. HP Z1 G3 Workstation HP introduced world’s first workstation all-in-one: the new HP Z1 G3 Workstation, combining the simplicity of an All-in-One design along with performance typically found in traditional tower workstations. Nice blog,very interesting blog thank you for sharing this blog..
You have posted Very good information to all readers .surely i am very much interested in reading this type of articles .keep posting more articles.